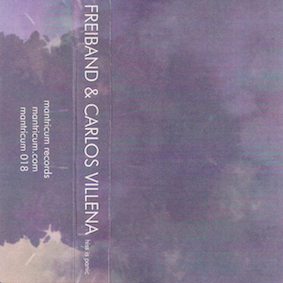 Today I got, finally, my copies of a cassette release, a split with Carlos Villena. He runs the label that released it, Mantricum. Late 2009 he approached to do some collaborative work and I work quickly on a piece based on his radio sounds. The idea was that it was it was to be a CD in an edition of 200 copies. I think the Freiband work, all computer based, fits best on CD or CDR. It was to be out soon (February last year). But it didn’t happen. In November it was still announced as a CD, so much to my unpleasant surprise, it became a cassette. I probably whined too much as Villena announces also a CD version of it, in an edition of 100. I have some for sale.